When my Mom moved out of her parents’ house, my Grandma decided she wanted to do something special for her first Christmas. 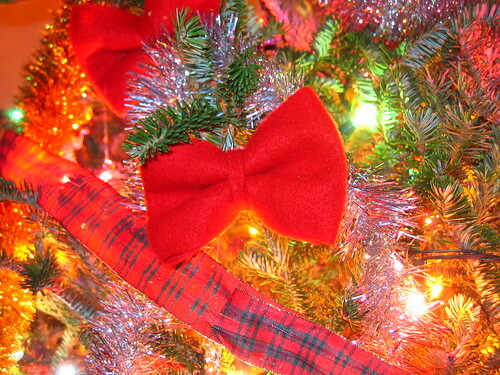 So she bought several yards of bright red felt, created a pattern, and sewed, by hand, 50 red bows for her Christmas tree. Each bow was about five inches wide and three inches tall. They were all “tied” with a small strip of felt and sewn in the back, and an ornament hook was sewn in to hang the bows on her Christmas tree. When we were kids, we had an oddly shaped artificial tree. The ornaments didn’t hang on the tree, they more or less “laid” on the tree. As the years went on, we replaced the old tree with a new, more symmetrical tree, and we decided to be more particular about how it looked. So we decided to drape the garland from branch to branch and hook a bow at each point. 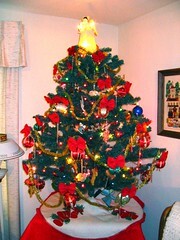 This way we had a much prettier tree, and we could feature my Mom’s Christmas bows more prominently. It was the perfect way to honor Grandma’s memory, and continue the family tradition. We continued this tradition even when we replaced the big tree with a smaller tree (shown at left). When my sister and I moved out of their house, my Mom decided to continue the tradition further. She purchased many yards of red felt — a slightly coarser and thicker grade felt than Grandma had used — and copied the pattern from one of her own bows. She cut the felt, created the bows, and sewed them together; then glued the “tie” on and the hook in the back. She created 50 for me, and 50 for my sister. When my sister and I opened the bows that Christmas, we instantly burst into tears. We knew Mom was making the bows, but we didn’t know she was making them for us. And from that Christmas on, the bows adorned each of our own Christmas trees. So this weekend when I put my tree up, and I open that box of bows, I will instantly be reminded of how much love went into them. And I will remember how much love went into the bows my Grandma created for my mom. That’s what tradition, and love, is all about. Next postKeep your votes coming!